The watershed drainage area of the Ohio River Basin, excluding the Tennessee River Basin, includes parts of Illinois, Indiana, Kentucky, Maryland, New York, North Carolina, Ohio, Pennsylvania, Tennessee, Virginia and West Virginia. The total drainage area for the Ohio River Basin is 203,940 square miles. The total area of the Ohio River Basin covered by the Mid-Atlantic States of Pennsylvania, Maryland, Virginia and West Virginia is 43,405 square miles. Population based on 1970-2000 U.S. Census Data. Major Rivers and Streams: Most of the Ohio River Basin is drained by tributaries; less than five percent of the basin runoff drains directly into the main stem. The runoff characteristics of the tributaries, therefore, determine the quantity of flow in the Ohio at any time. Two main tributaries, the Allegheny and the Monongahela, located in the Middle Atlantic Region form the beginning of the Ohio River at Pittsburgh. Located on the Allegheny Plateau, the Allegheny Watershed crosses Pennsylvania and New York and covers 11,770 square miles of drainage area. Within the Watershed are 13 sub watersheds (eg. French Creek, Clarion, Kiskimenetas-Conemaugh) and numerous sub-sub watersheds. The watershed covers 22 counties and has 325 miles of main stem. 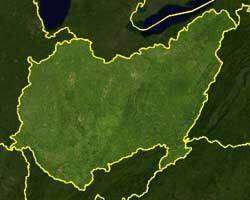 Located within the watershed are the Allegheny Mountains extending west from the Appalachian Mountains. The headwaters of the Allegheny River are located in upland forested areas and the terrain of the watershed remains a mixture of mountains and plateaus throughout the watershed. The formation of the Ohio River at the confluence of the Allegheny and the Monongahela Rivers is known locally as the Three Rivers area. The total drainage area for the Ohio River Basin is 203,940 square miles. The area covered by the Monongahela River Watershed is one of the most industrialized areas in the country and includes the coal fields of West Virginia and Western Pennsylvania. The watershed flows through 7,400 square miles of drainage land in three states, with the main stem extending more than 128 miles. There are six sub watersheds that cover the states of Pennsylvania, West Virginia and Maryland, two of which are the Cheat River and Youghioghey River watersheds. The Monongahela River watershed also includes 85 miles designated as a National Wild and Scenic River and the Cheat River is located within the Monongahela National Forest. The Ohio River is 981 miles (1582 km) long, starting at the confluence of the Allegheny and the Monongahela Rivers in Pittsburgh, Pennsylvania, and ending in Cairo, Illinois, where it flows into the Mississippi River. The Ohio River flows through or borders six states: Illinois, Indiana, Kentucky, Ohio, Pennsylvania, and West Virginia. The Ohio River is a source of drinking water for more than three million people. More than 25 million people, almost 10 percent of the U.S. population, live in the Ohio River Basin. Approximately 150 species of fish have been collected from the Ohio River. The average depth of the Ohio River is approximately 24 feet. The widest point along the Ohio River is approximately 1 mile at the Smithland Dam. There are 20 dams and 49 power generating facilities on the Ohio River. For hydropower impacts, click here: Hydropower Impacts. The power generating facilities have a combined capacity in excess of six percent of the total US generating capacity. The navigation dams provide a nine-foot minimum depth for commercial navigation..
Over 230 million tons of cargo are transported on the Ohio River each year. Coal and other energy products make up approximately 70 percent of the commerce traveling by barge. ﻿Nonpoint source pollution from urban runoff, agricultural activities, and abandoned mines is a major cause of water pollution in the Ohio River. Fish Tissue Contaminants: Because many people eat their catch from the Ohio River, the Ohio River Valley Water Sanitation Commission collects fish and examines the tissue for the presence of certain chemicals that may be harmful when eaten by humans. Yearly results are sent to the states bordering the River. If necessary, states will issue "consumption" advisories, which place limits on the type and amount of fish that can safely be eaten. Dioxin: The upper two-thirds of the Ohio River, from its headwaters in Pittsburgh to Cannelton, Indiana (river mile 720), have been studied extensively for the extent and severity of dioxin contamination. Dioxin levels exceed water quality standards in Pittsburgh and decrease in concentration in a downstream direction, with an increase at Marietta, Ohio, and again where the Kanawha River meets the Ohio. Studies have also pinpointed elevated levels of bacteria from such sources as combined sewer overflows (CSOs) (Combined sewer overflows occur in older cities with "combined sewer systems," where the sewer system collects both storm water runoff and sanitary sewage in the same pipe. During rainfall or snowmelt, volume in the combined sewer system can exceed capacity, resulting in direct discharges to streams, rivers, lakes or estuaries. These overflows contain not only storm water, but untreated human and industrial waste, toxic materials and debris). Acid Mine Drainage: Historically, the Three Rivers Area/Monongahela River Watershed was a leading industrial region for coal mining, resource extraction, boat building and metals manufacturing. Early European settlers recognized the importance of river transport and utilized the area for trade. A leading cause of contamination in both the Allegheny and the Monongahela is from acid mine drainage (AMD), which contributes to the degradation of water quality and biological conditions. Mine drainage waters can be low in pH and high in acidity and metals such as iron and aluminum. AMD has degraded thousands of miles of streams in the region. In addition to abandoned coal mines, abandoned oil wells in the region affect water quality as trace elements leach into surface water and ground water. The region also supports a wide variety of recreational activities, habitats and natural resources. Improvements in mainstem Ohio River water quality over the past 40 years have provided a cleaner river for aquatic life. ORSANCO works with local health departments throughout the Ohio River Basin to make bacteria data more available and to better inform the public about water quality issues. From May through October, ORSANCO tests the Ohio River for bacteria five times monthly at six stations. There are hundreds of watershed organizations active in this area. Many groups are committed to Acid Mine Drainage remediation projects. Listed below are some of the groups in the region. The Friends of the Cheat, along with over 20 stakeholder groups, created a proclamation called "River of Promise: A Shared Commitment for the Restoration of the Cheat River, West Virginia." The group is committed to restoring the Cheat River. The Watershed Atlas of the Monongahela and Allegheny Rivers includes images, detailed maps and historical references for the Mid-Atlantic portion of the Ohio River Basin.